Most of us will pay a lot of attention to the type of footwear we choose to wear in everyday life. And we also do not mind spending a small fortune to get something from the high-end brands. Unfortunately, the same is not always true when it comes to work shoes. But, for those of us that work in workshops, factory or construction sites, it will be necessary to find good waterproof work boots. While it is obvious that proper work boots help to protect your feet from the many hazards in the work site and prevent injuries, they can also help to keep your feet warm and comfortable. That’s right; we all want our feet to feel nice and cozy when working. Want to learn more about waterproof work boots? Let’s jump straight into our top 10 reviews of the best waterproof work boots and in-depth buying guide. Timberland Hyperion succeeds in being a tough and rugged work boot that still looks good enough for everyday wear. It is also a relatively lightweight pair of work boots to ensure that you do not have to carry around a lot of dead weight on your feet. 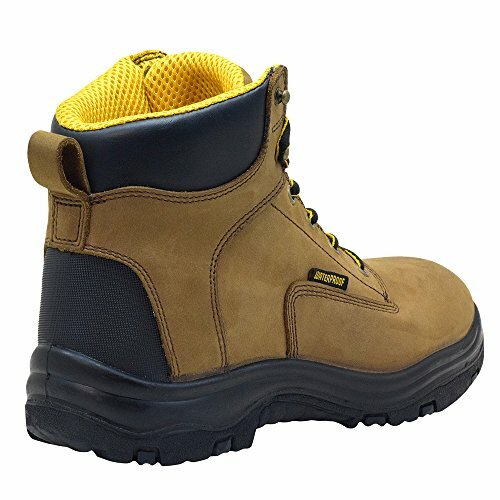 These boots feature a rubber double toe that is tough enough to protect your toes from various job site hazards. 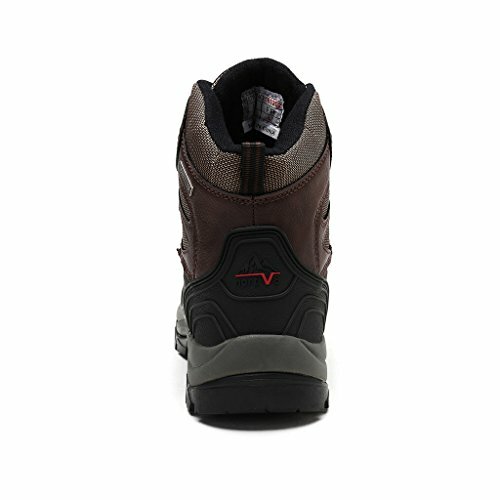 There is also an EVA-guard heel and some instep overlays that also help to enhance the safety and comfort of these work boots. 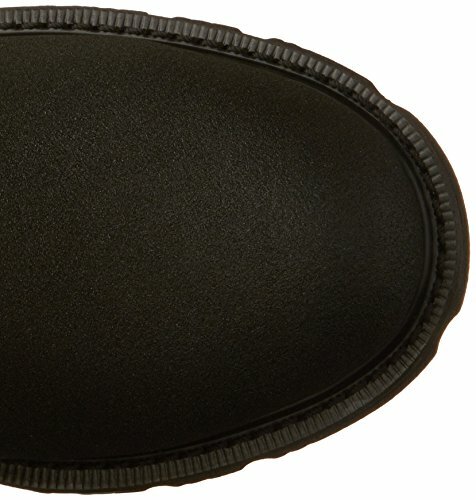 For extra foot support, there is a contoured insole that will be very useful around the ball of the foot and heel. And it combines with the molded EVA midsole to make the interior super comfortable. Timberland also uses an anti-fatigue technology that will absorb shock and return energy back to all the important zones for extra strength and stamina. With the Hyperion work boots, you can always be guaranteed of maximum safety and comfort whether you are working indoor or outdoor. The boot is true to size and also fits well to make a great choice for all-day wear. And with the contoured insole design, you can be sure of getting adequate support in all the key pressure points and impact zones. The style and overall appearance also suit most men’s preferences, and so if you are looking for a pair of work boots that guarantees good performance, comfort, safety, and maximum relaxation the Hyperion will be a great choice. The 8-inch Men’s Direct Attach by Timberland Pro are designed to provide that extra height for maximum coverage and protection. 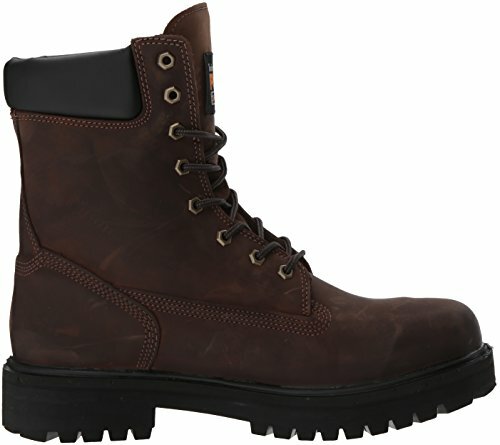 And it is a genuine leather upper section work boot to make it highly durable. These insulated waterproof work boots are also an excellent choice when you want to beat the cold weather. They feature a 400g Thinsulate insulation that should be more than enough to keep the feet warm and cozy when working in cold environments. 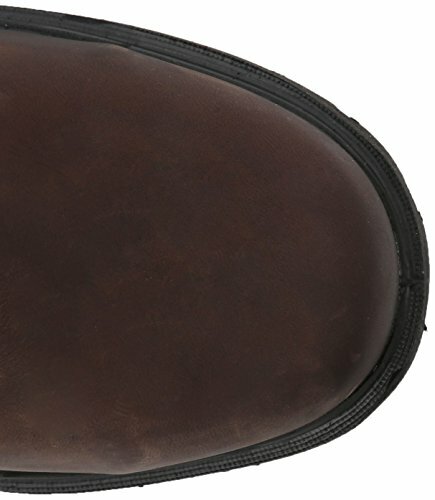 The premium leather upper section is also seam-sealed to make it waterproof. And so these work boots will be an excellent choice for working in wet environments. Wouldn’t it be great to always end up with warm and dry feet at the end of your work shift? With these work boots, this will always be the case. Men also never have to worry about bacteria and bad odors when wearing these feet thanks to the Agion antimicrobial treatment of the mesh lining and insole. And for some extra comfort, the collar is also well-padded. There is no doubt that the Timberland Pro Attach Direct is one of the best waterproof boots for men out there. But, just how effective are they in keeping water out and ensuring the feet remain dry? Well, the seam-sealed construction and the fact that they are genuine leather upper shoes is enough to show that no water can get in while the 400 grams of Thinsulate insulation is more than enough for insulation. These well-constructed work boots are also generally more comfortable, supportive and guarantee excellent traction in all surfaces. The premium full grain leather that makes the upper section of the Ultra Dry makes them completely waterproof, and hence ideal for use almost anywhere. If you also factor on the polyester insulation then you have that perfect pair of work boots for use all year round. For the waterproof properties, Ever Boots makes it with a Seal-Direct attached construction to form a weather-proof bond to the upper section. The impenetrable barrier created keeps liquid elements out while also ensuring the moisture that your foot generates can still escape. 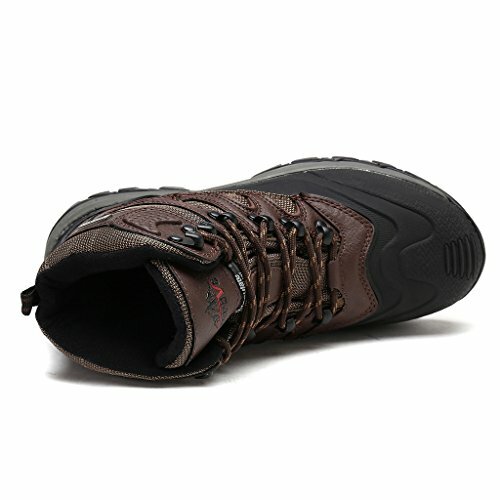 And to make things even better, the stitching on these cheap waterproof work boots is also top notch, and they use some highly durable and waterproof laces. Foot fatigue should also not worry you with these boots as they come with durable polyurethane midsole to help with this. When it comes to keeping water out, these boots from Ever Boots are one of the best options that you can get. And the best thing about them is that they also allow sweat to escape so that your feet always remain dry. Their relatively affordable price tag and the flexible bending rubber sole that also provides excellent traction in all surfaces also help to make this a top-notch pair of work boots. And if you are shopping for waterproof work boots for under $100, you will hardly get a better option than the Ultra Dry from Ever Boots. Don't forget work boot aftercare and for this cleaning and conditioning is vital. 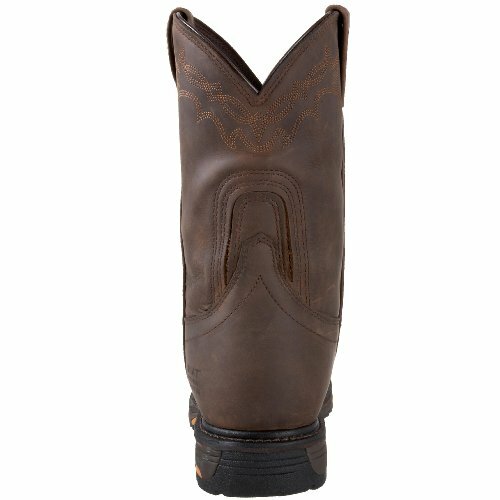 If you prefer tall pull-on boots this Ariat pair will be perfect. It features a 10-inch high shaft but it is also quite easy to wear thanks to the dual pulls on the shaft. They are full grain leather work boots, and so you can be confident that they will keep water out and last for many years. Ariat uses a unique ATS Max platform that will provide maximum torsion stability to minimize foot fatigue and ensure proper body alignment. There is also a lightweight EVA midsole that combines with the gel-cushioned footbed to provide excellent shock absorption. Other things like the extra-wide shank forefoot and heal stabilizers will help to provide extra support while also minimizing foot fatigue. Do you have a pair of some high shaft boots on your closet? 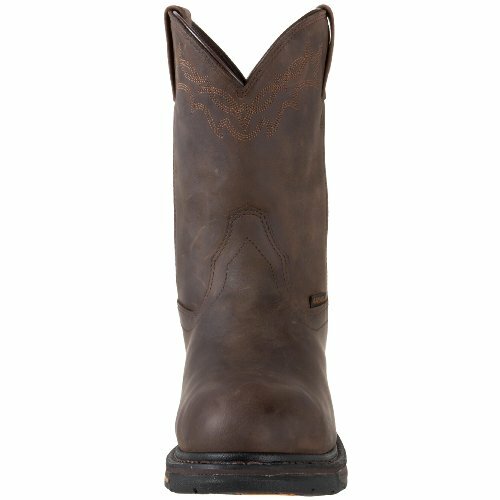 If not, you should consider buying these ones from Ariat as they do not only look amazing but are also comfortable, tough and durable enough. The full grain leather upper section will combine with the slip and oil-resistant rubber outsole to make this a highly durable work boot. And you will also never have to worry about shock as they have an excellent shock absorption system. All in all, these are great work boots if you prefer something with a tall shaft. Shop for work boots early in the evening or at least late in the afternoon when your feet are at their largest size. When you want some affordable work boots, those made from a manmade material like this pair from Arctiv8 can be a great choice. Although it is not as durable as full grain leather, it is still quite a tough pair of shoes. Despite not having a leather upper section, these boots are still waterproof to make them ideal for use in different work environments. And they come with a sturdy rubber outsole with some multi-directional lugs for excellent traction on various surfaces. And you can always be confident of keeping your feet warm and cozy when working on the snow thanks to the 200g Thermolite insulation. There is also a cushioned EVA footbed to provide that extra comfort for your feet and a warm layer of cozy insulation. We all love leather boots, don’t we? It is obvious that leather is a durable and waterproof material but it also tends to be pricey. However, this work boot proves that you do not always need leather to have waterproof work boots because the man-made materials are still effective in keeping water and oil out of the shoes. As if that is not enough, these shoes also have an appealing look with detailed stitching on the uppers and a tough genuine rubber outsole that guarantees excellent traction in all surfaces. And these are also highly affordable work boots. Do you work, in an environment where you are always exposed to the danger of falling objects? If so, here is a perfect pair of work boots for you as it is designed with a steel safety toe for maximum protection. 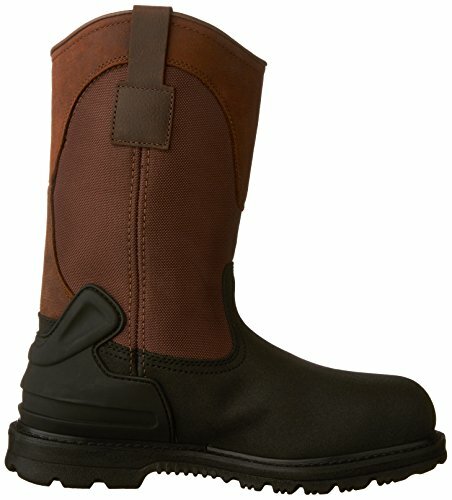 Besides the protection, these work boots also look good enough and they are also quite durable. The Rigmaster XT boots have a genuine leather upper section that is not only highly durable but also effective in keeping water out. And the shaft measures 6 inches to ensure that it provides adequate coverage while also giving the feet enough space to breathe. The sole is synthetic and although it might not be as durable as leather, it is still rugged enough and will deliver great traction for all surfaces. For the interior section, there is an antimicrobial lining to protect the feet from toenail fungus. 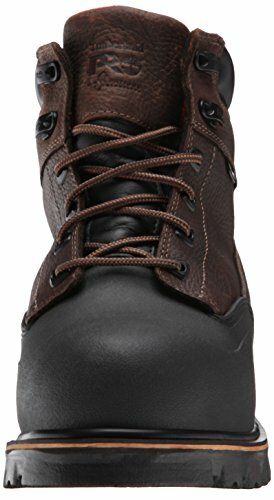 The fiberglass shank is also a great addition to the shoe’s design as it provides some structural support while the unique Timberland Pro vamp helps with heat resistance and making these work boots extremely durable. 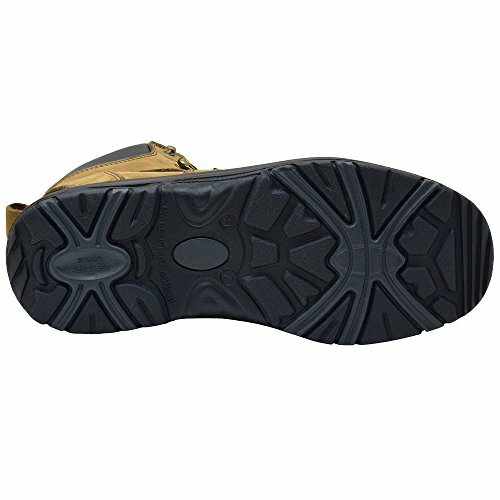 There are several things that make these shoes stand out, but the steel toe is probably what many men will love about them as they provide maximum job site protection for the toes. 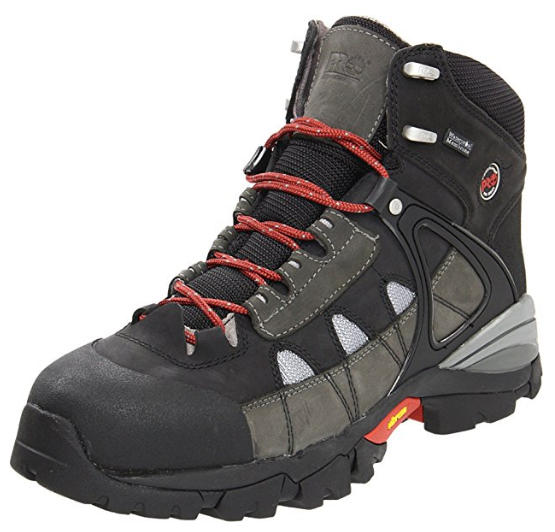 The waterproof leather upper and padded collar and tongue are also great. Despite the outsole not being as high-quality as rubber, it is still good enough. Overall, this is a great pair of shoes that are not only safe but also comfortable enough and quite durable. 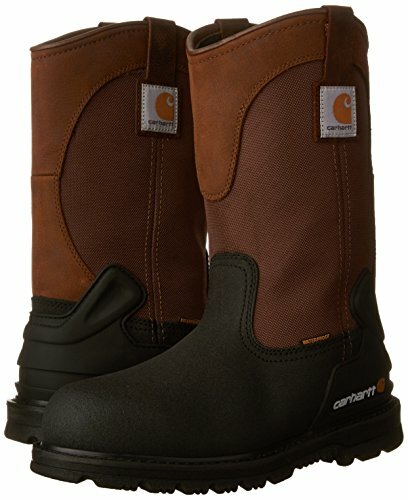 If you want a pair of lightweight waterproof work boots this pull-on pair from Carhartt will be ideal. And this is because it features a lightweight synthetic and leather upper section that is lighter than full grain leather. 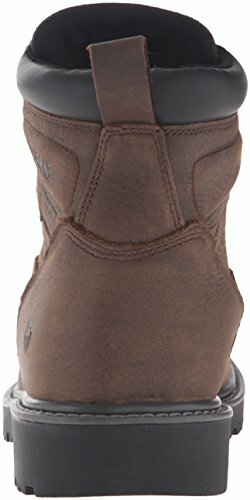 Despite this being an 11-inch shaft work boot it is still quite easy to wear as it comes in a pull-on design with dual pulls at the top. These are also great work boots for work environments that require more safety precautions as they come with protective steel toes. Appropriate for garden work with a chainsaw. The outsole is also a synthetic material which is not only lightweight but also quite rugged and will deliver excellent traction. There is also sufficient insulation on these boots for cold weather protection as it uses the 400 LiteFire Insulation. These boots might not be as tough as the genuine leather ones with rubber outsoles but they are still quite tough and rugged to withstand daily wear for many years. And safety is also taken care of thanks to the protective steel toe. What about insulation and waterproof? Both are also relatively well-taken care of which makes this a good pair of work boots for use in almost any environment and in any season. Protection is vital for any work boot but also don’t overlook the comfort. It is pretty obvious that a good work boot should not only be comfortable but also effective in keeping water out and your feet warm. The 6-inch Wolverine Floorhand has a mechanism to help with all these things. And they include the full-grain leather upper section that makes the shoes highly durable and is also effective in keeping water out and enhancing breathability. For the sole, the shoes use a genuine rubber material that grantees you always get excellent traction even on slippery floors and is also quite durable. And the interior comes with a well-cushioned and removable footbed that cradles the feet and keeps them cozy all day. The soft toes might not offer the same level of protection as the steel or aluminum ones but they can still be very useful in various work environments such as when working indoors with a saw or when you have to go through metal detectors. There is nothing fancy about these work boots and they will probably not stand out. That is what most men prefer! And so their simple and somewhat basic appearance is one of their most impressive elements. However, these are also well-built work boots with top-notch craftsmanship and excellent stitching. And if you combine this with the fantastic choice of upper and outsole materials, you have a perfect pair of boots that you will use for many years. Any waterproof work boot made in the USA will always perform well as there are some strict standards that manufacturers have to adhere to. However, there are still some imported ones like these ones from Keen Utility that are still as high-quality as the locally made ones. They feature a durable textile and leather upper section and with some detailed stitching that gives them a very appealing overall appearance. 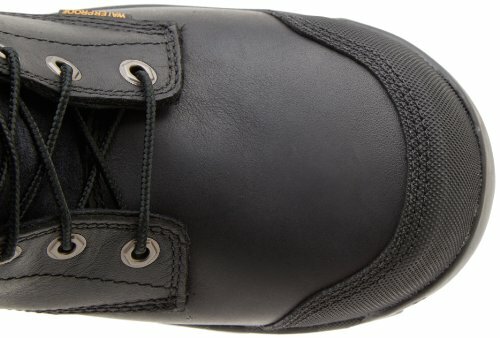 For the outsole, they come with non-marking rubber that also helps to make these waterproof slip resistant work boots as it does not slip on either water or oil. 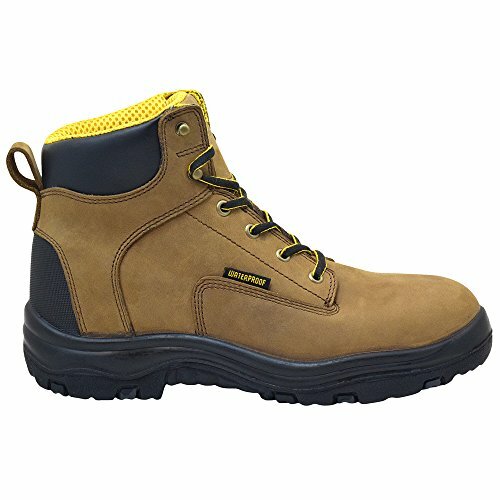 The 100% non-metallic construction is very useful for various work environments, and it also makes these waterproof work boots great for everyday wear. 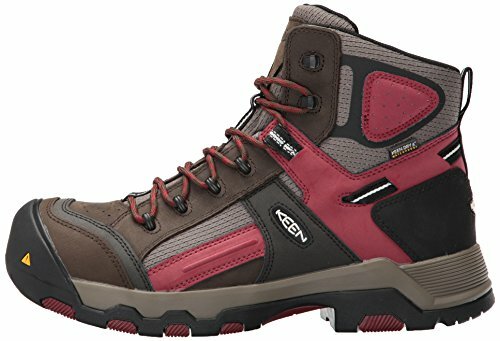 Other great features on these 6-inch work boots include the asymmetrical composite toes, PU midsole, and the breathable/waterproof Keen Dry membrane. Isn’t it a great idea to have a pair of boots that you can also wear when not going to work? Well, most of us still wear our work boots almost anywhere regardless of how they look. But, these ones from Keen Utility are designed to suit both the work environment and also as fashionable footwear to add to your collection. These are also lightweight waterproof work boots that make use of various technologies and designs to make them comfortable, breathable, warm and significantly long-lasting. Black waterproof work boots are always a great buy as they seem to go well with almost any outfit, and so the black oil tanned shade on these ones is one good reason to buy them. 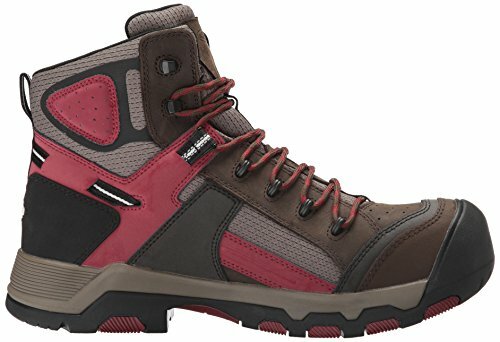 But besides the color, these are also highly durable and super comfortable work boots that will be great for wearing all day and even daily if you want. The upper section is a genuine leather material that is well stitched for durability, and there is a protective composite safety toe that is also lightweight enough. And for the outsole, these shoes use genuine leather to guarantee that you always get excellent traction regardless of the surface and it is also quite long lasting. This rugged and tough Carhartt work boot also comes with a waterproof membrane that will help keep your feet dry even when working in a wet environment. And there are also some ortholite insoles for excellent cushioning and flexibility. The chances are that you already have several pairs of black shoes. But, isn’t there always room for one more pair? Probably yes. And so this black oil tanned work boot will be a good buy. The cool thing about it is that it not only looks good and masculine but it is also a tough and comfortable pair of work boots. And with all the good features that you can expect from a high-quality waterproof work boot such as a tough leather upper and rubber outsole, you can be sure of wearing these shoes to work for at least a few years. 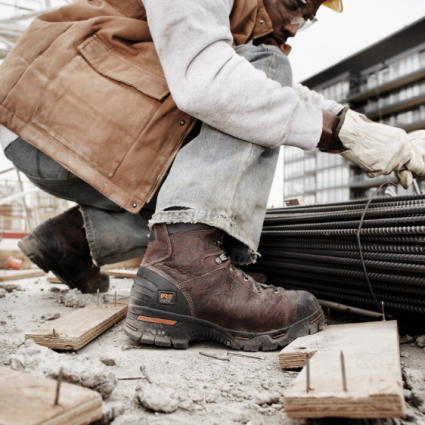 Wouldn’t you want to have a work boot that looks good on you and is also comfortable enough to wear all day? But, there are plenty of work boot brands out there and all make products that look good enough. Well, at least from the surface. To make sure that you do not end up getting disappointed, it is important to keep the following vital factors in mind when choosing waterproof work boots. How do you intend to use the work boots? Do you want to wear them in dry or wet conditions? 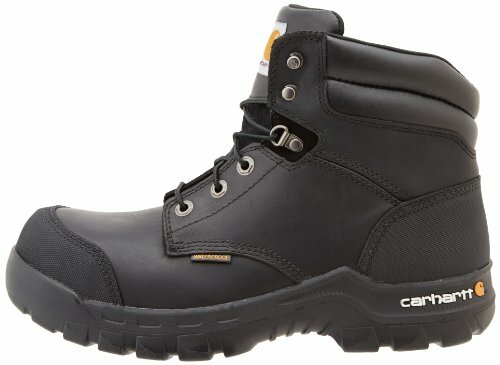 Are you looking for a work boot to use in winter or summer? Also, do you want boots for outdoor or indoor use? There are lots of work boots out there and answering these questions will help you choose the ideal one for your specific needs. Once you determine how you intend to use the work boots the next step is to choose the right type. Besides the overall categorization into summer and winter work boots, there are many other ways of categorizing work boots. And they include according to the toe types, height (full or ankle) and also the method of close up (lace up, zipper or slip on). You also need to consider the boot material when deciding what to buy. Here you will need to consider both the materials on the upper and the outsole. For the upper section, leather is the most popular option and we have already explained why but there are also other options like nylon, rubber or a combination of various materials. But, when it comes to the outsole nothing beats rubber. Here is the thing; a heavy work boot beats the purpose because you do not want something that makes your work even harder. If your work will entail a lot of movement or walking for long distances, a heavy boot will only weigh you down as it will be dead weight hanging on the feet. Just like with any other kind of product, there are some brands that will always stand out when it comes to the manufacturer of work boots. 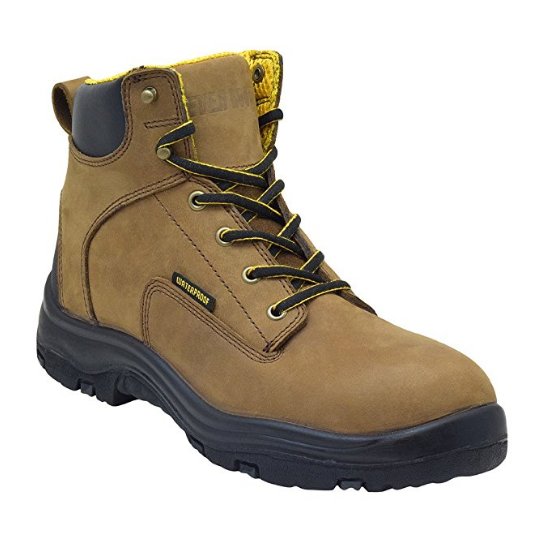 These companies have been in business for the longest time and understand well what defines top notch work boot or what people are looking in this kind of footwear. And so when shopping for your pair you can trust them to have something durable and comfortable that meets your specific needs. Some of these top brands include Timberland, Wolverine, and Carhartt. 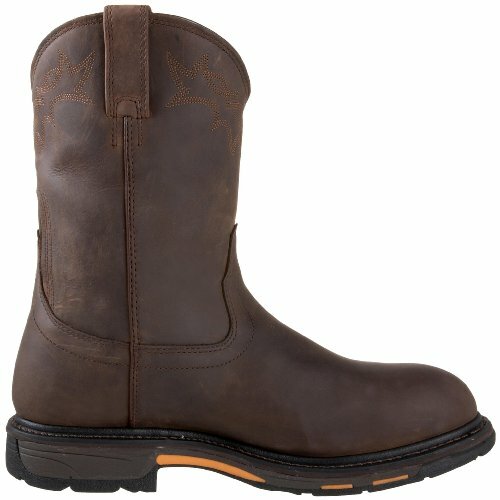 Check also these brands: Ariat, Red Wing, Keen, Caterpillar, Rocky, Nike, Irish Setter. Have you ever wondered why work boots look so tough? Well, we all have at some point. And the answer is simple, they are well-made. Before you go out to buy that pair of lightweight work boots, it is always a wise idea to understand how it is made. When it comes to the construction, the first factor to consider is always the material for the uppers as this makes up the largest part of the boots. And while it is true there are several types of work boot materials, leather is by far the best option. But, there are also different kinds of leather. 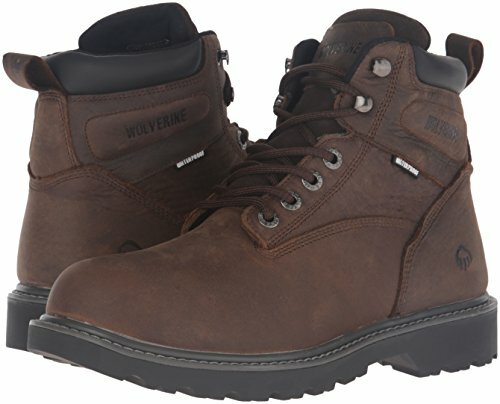 However, if you want a tough enough all-purpose work boot full-grain leather is often the best choice. Isn’t leather too hot for summer? You will be surprised at just how breathable some leather work boots can be but we are probably not likely to convince you to wear some thick and tough leather boots in summer. But, is there an alternative? Definitely yes! Some of the best summer work boots will feature a fabric or mesh material for the uppers. Mesh is highly breathable and the kind that makes work boots is also quite tough to suit different work environments. Imagine this; you get that lovely pair of work boots that looks fantastic on you and with an equally durable leather upper section only for the sole to break apart after a few trips to the workshop. Besides the obvious disappointment that comes with this, buying such a boot will be a waste of hard earned bucks. You wouldn’t want to waste any cash, would you? Definitely not. Especially with the current economic crunch. 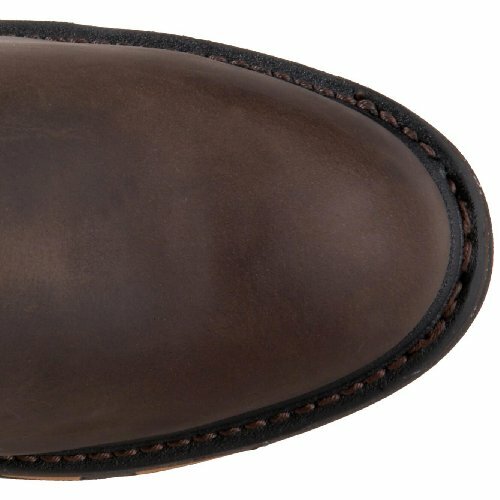 So what defines a good work boot sole? 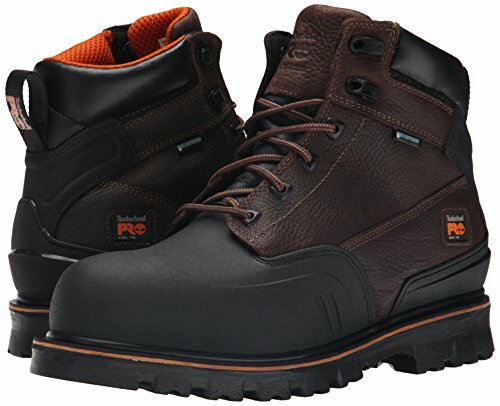 Rubber makes fantastic waterproof work boots as it is tough enough and ideal for use in almost any work environment. It is oil, abrasion, and slip-resistant which is just what every worker in the construction and manufacture industry needs. Also, it will provide great traction on both dry and wet surfaces. 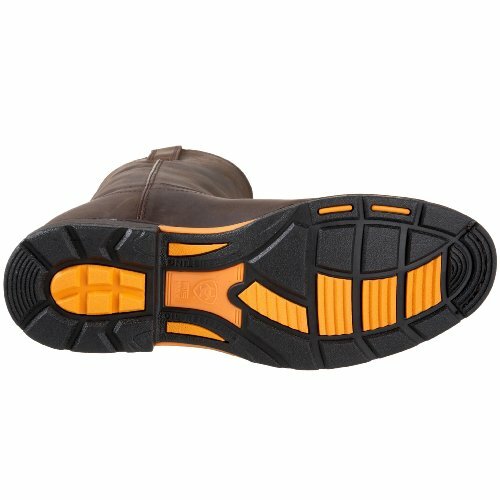 From Vibram to Goodyear Welting, different work boot manufacturers will have different kinds if rubber soles and this allows them to add some unique safety and performance attributes to the footwear. Work boots will often have several special features to help improve their performance. While some of these features are not necessary, they are vital when it comes to making the boots comfortable and suitable for different kinds of work environments. And although the features will often vary from one brand to the other, the following are some of the most common ones to watch out for. Weather protection is an important feature to look for if you intend to wear the boots when working in a cold environment. For insulation, some boots will have liners on the inside while others have membranes built into the sides. Overall, the best insulation materials are fur, wool, and synthetics as they are highly effective in keeping the feet warm. Comfort is one of the factors that define a good pair of waterproof work boots. If you spend a lot of time on hard surfaces like concrete and sidewalks, it will even be more important. Most work boots will have this covered. They will have compression pads built into the sole which are very helpful in such situations. These pads have a material that absorbs shock when weight is applied and also reduces fatigue. When buying waterproof work boots, safety should be at the top of your mind. And while the overall design and materials will help make these boots safe for different work environments, there are also some special features like metatarsal guards to help with this. Metatarsal guards are designed to offer protection from falling objects for the toe area and upper foot section. They can also be advantageous for those that work in environments where falling embers and other hot materials are a concern. Don’t we all love shoes with laces? 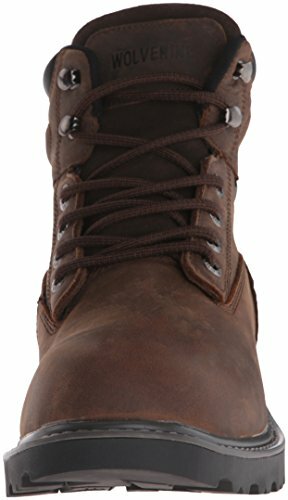 Lace-up shoes are probably the most common type of footwear, and this is also true when it comes to waterproof work boots. These shoes make it easy to get a custom fit as you only need to adjust the laces, and they also tend to be quite stylish. Most low cut or ankle high work boots will have laces for closure. And besides, from checking the quality of the laces and eyelets, it is also worth noting that the number of eyelets also matters. Slip on or the pull on work boots are the type that will have some sort of elastic in the ankle section for low cut boots and a wide shaft for the tall ones. This elastic makes them easy to wear and remove by expanding the opening. They are a good idea for those that hate tying laces or work in an environment where it is easy for laces to get caught in something. Did you know that one of the main reasons for the invention of cowboy boots was to give cowboys something comfortable to wear when herding cattle? To simply state it the famed cowboy boots are just a stylish type of work boot. Western style or cowboy boots will feature a tall shaft which can be plain or with some intricate patterns and some will also have a zipper on the side. And the fact that most are made from genuine leather makes them highly durable and waterproof. While the traditional raised heel design is the most common when it comes to the work boots, it is not the only option. Nowadays there are many boots that will come with a rubber wedge sole design. The waterproof wedge work boots are a great alternative when you want something that offers excellent traction because the entire sole will be in contact with the surface. Work boots with zippers are another great alternative for those that do not want to have to deal with laces or want something that is easy to wear and remove. The zipper is typically on one side and for most, it is almost as long as the shaft. Zippers also add some style to the work boots. The 6-inch or ankle height work boots are slightly smaller than the 8-inch types and are designed to offer decent joint and ankle protection. They will also allow more air to pass through the collar to cool the feet sufficiently. Also, they are generally lighter than the 8-inch boots and they work best for open conditions. These lightweight waterproof work boots are great for working in the farm, commercial industry and around the city and they will go well with almost any wardrobe. 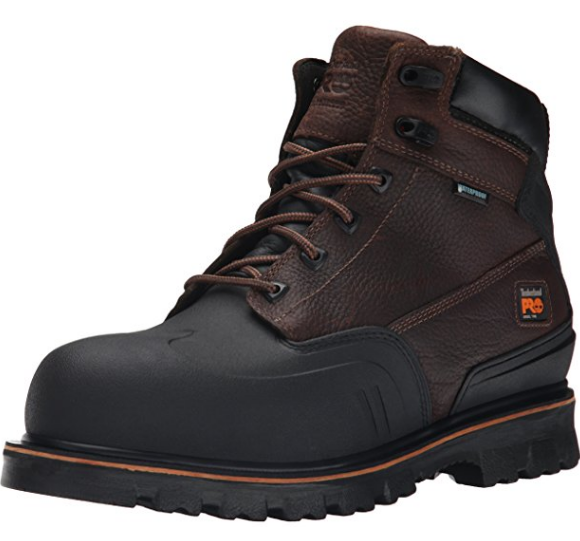 When you need waterproof work boots for working in the construction industry and other tasks like logging, the 8-inch waterproof boots will be a great choice. As they are significantly larger (higher or taller shaft/upper section) than the 6-inch types they are also warmer and will offer more protection for your feet. 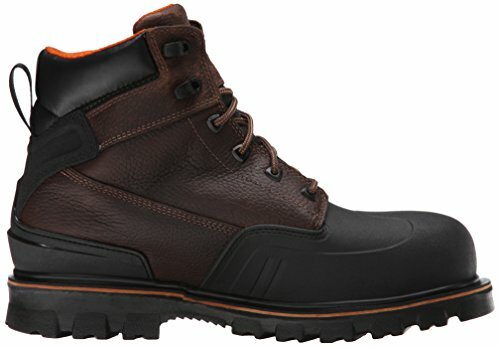 Waterproof 8-inch work boots are generally more versatile and are best suited for outdoor use. Just try and recall how painful it felt the last time you bumped your toes into something. Your toes are one of the most vulnerable parts of the body when working in any environment as they get bumped and tripped often. Also, there is the real risk of falling objects. 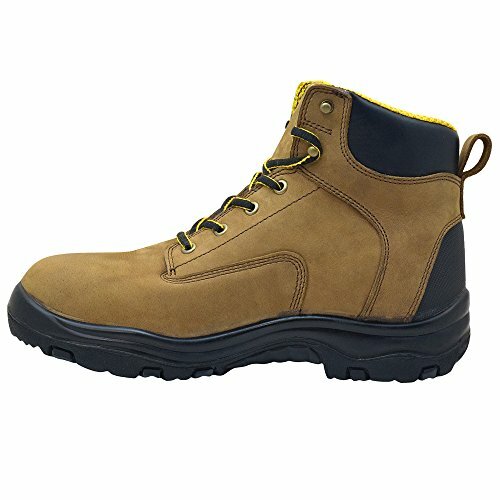 Steel toes are the traditional choice for most work boot manufacturers. They are the best pick when you want something that always offers protection beyond the call of duty. Their greatest advantage is that they are hard to damage and they will bend under pressure without breaking. But, they also tend to conduct temperature more than the other types and so they will not be ideal for working on extreme temperatures. When you want something that offers sufficient protection but is still lightweight enough, an aluminum toe is one of the best choices. These toes tend to be thicker than the steel ones, and despite being lightweight they still meet the safety standards set by ANSI. Composite toes for work boots will comprise of plastic, Kevlar or carbon fiber and they also meet the ANSI/ATSM safety standards. Fundamentally, they are the same as the steel toes but more lightweight. However, the composite toes tend to be ticker and will give your shoes a bulkier feel. But, since they are nonmagnetic and nonmetallic they will not transfer any heat or cold to your feet. These toes will be ideal for places prone to electrical hazards and require one to wear metal-free shoes. While the safety toes can be very protective, sometimes you just don’t need them. Well! Probably most of the time for the many of us that work indoors. Hence, if you are working on something where your toes will not be in any danger of getting crushed or bumping into something, soft or non-protective toes are the best options for you. Shoes with these toes focus on other important features and not on having tough and weighty toes. Examples of jobs where soft toes are enough include shoveling sawdust and clearing water or oil spills. Isn’t it great to know that you never have to worry about the safety of your toes provides you pick a good pair of work boots? But, that is not all as there are still many other fantastic work boots features you need to know. As you already know, all work boots are not created equally. They are made from different types of materials, and to choose the right one you need to consider what is appropriate for your particular work environment. 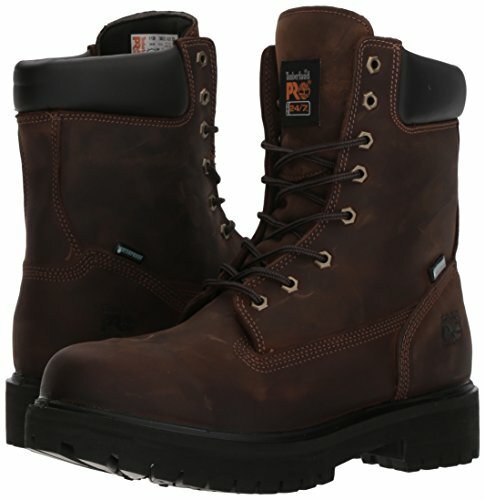 Full grain leather is the most common and probably also the most popular work boot material. With genuine leather boots, you can be confident of having something highly durable and tough enough for any work environment. Surprisingly, leather boots are also quite breathable. However, there are also several types of leather to pick from with side leather and calfskin being the most common. But, leather boots also take some time to break-in. Gore-Tex work boots make use of man-made technologies to make work boots that are completely breathable and absolutely waterproof. This fabric has a special membrane that will allow perspiration to escape through it and ensure that water never gets in so that your feet always remain dry. And despite not being as tough as full-grain leather, it is still durable enough. A lot of people tend to view nubuck as a completely different material from leather as they look and feel different but this is not correct. Nubuck is just top-grain cattle leather that is buffed or sanded on the exterior or grain side. Sanding of buffing gives the material a slight nap of protein fibers and this, in turn, produces a velvet-like surface. And like any other leather materials, it is highly resistant to wear. When you do not want to buy a pair of expensive leather work boots but would still want to wear something that looks like leather faux leather is your best pick. It is a plastic fabric that is made to look like leather and it is not only lighter but also less restrictive than the latter. Also, you can dye it into almost any color. It comes in various forms with some having better quality than others and the most common ones are vegan leather and leatherette. Rubber makes the best work boot outsoles but there are also many types that will use it for the upper section. With rubber or PVC work boots you get footwear that is not only impervious to water but also super easy to clean. However, these boots can be quite cumbersome because the fit is not adjustable. The rubber work boots will come with or without rubber protection and most are cheaper than leather ones. When do you intend to use your work boots? Or to rephrase that; do you want winter or summer boots? If you did not know this already now you do. There is a work boot for every season and while some pairs can work well all year round it is always a great idea to go for something that suits the particular season. With waterproof summer work boots, there are two important factors to keep in mind. First, you need a work boot that is breathable enough to keep your feet cool in the intense summer heat. And secondly, it should also be able to allow the perspiration to escape because at some point you might still end up with sweaty feet. Mesh and fabric are often the best options for your summer work boots but there are also some leather ones with a moisture-wicking interior lining that can also be cool and breathable. But, avoid those with heavy insulation as they are not very appropriate for the summer heat. To simply state it, some breathable waterproof work boots are what you need to beat the summer heat. Winter is almost the perfect opposite for summer and it will come with different challenges. Unlike summer, you have to deal with extremely low temperatures. The snow that comes with the low temperatures is perfect for outdoor activities like skiing but you still need to do some work. And so it is vital to get the best winter work boots. Here it is all about finding something that is effective in keeping your feet warm and cozy. When it comes to buying winter work boots, insulation should be at the top of your mind. Depending on the brand that you buy, some of the most popular insulation materials are wool and fur. There are also some good synthetic insulation materials if you are going for a cheaper work boot. But, full-grain leather is also very useful in keeping out the cold than fabric materials. Another important factor to watch out for when buying winter work boots is the traction and you need something with an outsole that makes walking through snow easy. Step 1: Clean the Boots – Before you do anything to your boots, it is always important to get all the dirt and mud off and clean them thoroughly. In the next section, we will discuss how best to clean your boots. Step 2: Apply Waterproofing Paste or Cream – Once your boots are clean and dry, the next step is to apply a waterproofing paste, cream or dubbin wax. And the best way to do this is by applying a small amount of the paste, cream or wax on a clean cloth and then rubbing it over the boots generously. Also, make sure you run in a circular motion and make sure you do not forget the seams. Step 3: Rub Off Excess – After working the waterproof compound into the boots for a few minutes, you should now take a clean cloth and wipe off any excess. You can also repeat the application if necessary. Step 4: Leave them to Dry – Depending on what you are using, your work boots will need anywhere between 30 and 60 minutes to dry. But it is vital to leave them to air dry and not attempt to use any source of heat to speed up the process as this can cause the leather to crack. Step 5: Buff Off – The last step which is to buff off with a dry and clean cloth is optional as it is only meant to give the boots a neat shine. Caring for your work boots starts immediately you get them. One of the first things that you need to do is to break them in properly. Work boots break-in is indeed easy and contrary to what you might be thinking you do not need to apply oil. Instead, you should let the shoes break-in naturally so that they can mold to the shape of your foot and provide a snug and custom fit. Cleaning your work boots is the most important part of care and maintenance, and also what you will need to do often. The best method to clean your work boots is using leather cleaner and a dry cloth to wipe the dirt of gently. But, you can also use liquid dishwasher soap if you do not have a leather cleaner. Once the work boots are dry the next step is to condition them. Conditioning will require you to have some mink oil. You should apply it with a dry cloth while rubbing it in well and applying some extra oil in the seams and stitching before allowing the boot to dry for a few minutes. Polishing helps to improve the aesthetics of the boot and it is the easiest part of care and maintenance. All you need is clean and dry cloth and some leather shoe polish if you want to use it. Otherwise just rubbing the dry cloth over the shoes vigorously should do enough polishing and buffing. This care and maintenance routine method is for leather work boots because other materials like nubuck might require different cleaning agents. Wouldn’t it be great to get some assurance that your work boots will last for at least a certain period of time? And while a warranty might not look like an essential factor to consider when buying a pair of work boots, it is always great to go for something with one. Many work boot brand will often not specify the warranty unless you request through their support. And in case there is no warranty you should look for something with at least a money back guarantee. A 30-day guarantee to get back your money in case the work boots do not impress you or certain features like the waterproof fail should be good enough. 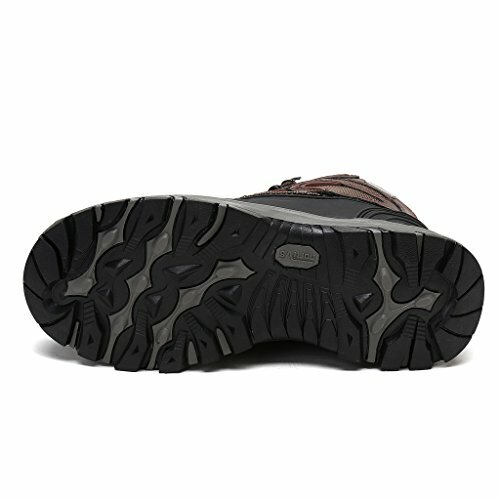 Do I need a Steel or Composite Toe? A steel toe offers the best protection from falling object, impact or penetration by sharp objects. Composite ones will do all this but they are nonmetallic to make them ideal for going through metal detectors and for working in places prone to electrical hazards. And so your work environment should guide you when picking between the two. 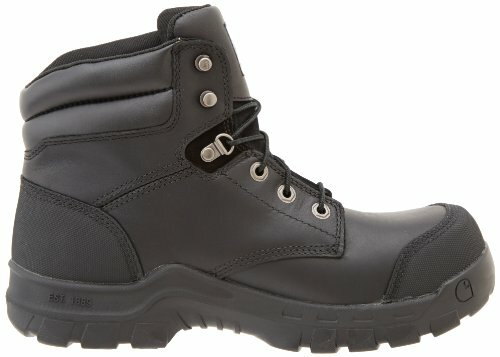 How Much Should I Spend on Work Boots? Well, it depends on your tastes and of course preferences. If you love expensive things from luxurious brands then you should be ready to part with upwards of $500. 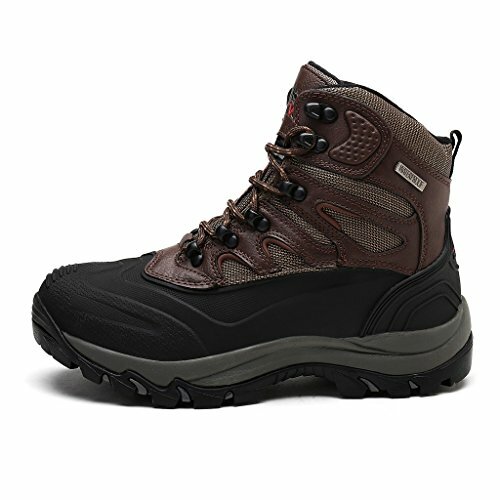 But, if you want a pair of basic or cheap waterproof work boots then it is possible to get them even for under $50. 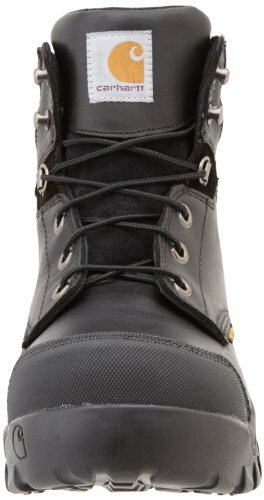 What is the Best Height for Work Boots? Or, how high should waterproof work boots be to work well? Waterproof work boots for men and also for women will typically range between 5 and 12 inches. But, the two common heights for men’s work boots are 6 and 8 inches. What you choose between the two depends on your work environment. And to state it clearly, the higher the shoes the more the coverage and protection but it will also be heavier due to the extra material. 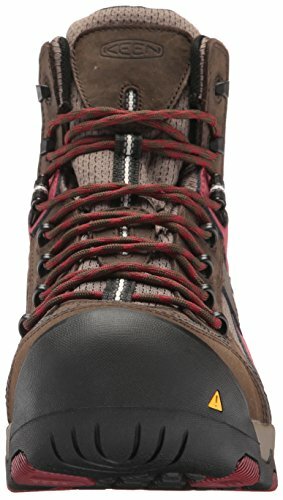 What Socks Should I Wear with Work Boots? It depends on the season. Cotton socks will not work well with your summer work boots as they absorb moisture and stay wet which will make the footwear uncomfortable. But, their insulating properties make them the perfect choice for wearing with winter work boots. For summer work boots, wool and synthetic fiber socks are the best thanks to their moisture wicking capabilities. 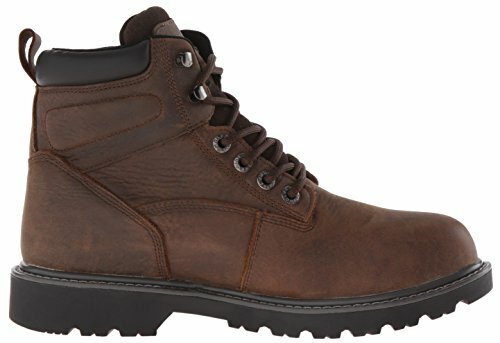 Which one is Better Between Laced and Pull-on Work Boots? 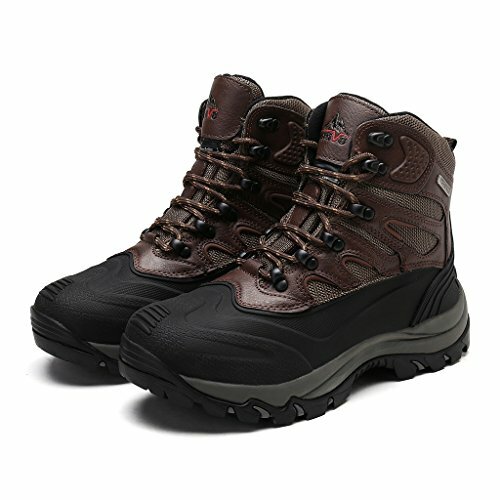 Waterproof work boots with laces are the most common option and many people will prefer them because they not only fit better but you can adjust them according to your feet or the socks you are wearing. Pull-on work boots, on the other hand, will work well when you prefer something easy to wear, and for work environments where there is a real risk of the laces getting caught on something. Now that you know all the important things about the best waterproof work boots, what is stopping you from going out and buying a pair? Nothing! And our top 10 reviews will also give you some idea on not only the best brands to go for but also specific models that will work well for you. And to be honest with you, each of the 10 work boots on our reviews is high-quality enough, comfortable, breathable, waterproof and also long-lasting. However, there is always that one pair that seems to stand out from the rest. Well, you might probably already have your favorite from the 10 work boots above but based on various factors such as upper and outsole material, and overall appearance, the Timberland Pro Hyperion is our top pick. Everything about the Hyperion is just fantastic including its price tag. And it also has an appealing overall appearance to make it great for everyday wear. There you have it, everything you need to know about waterproof work boots.